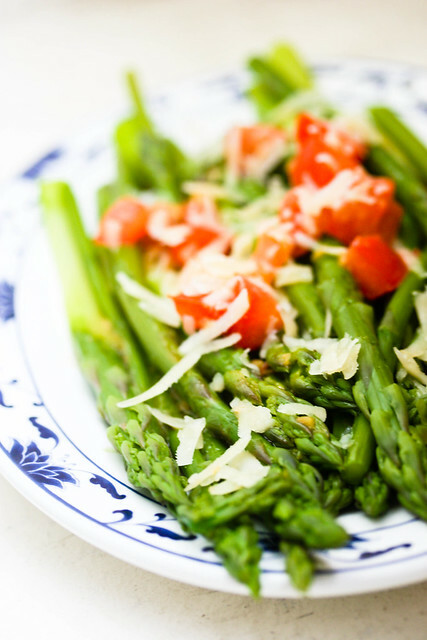 My Very Favorite Asparagus Vinaigrette is the name given to this recipe by Sarah Leah Chase in her book Cold-Weather Cooking, but it's the title I would have used as well. And it's definitely the title R would have chosen, because he helped me polish off the entirety of two pounds of asparagus for lunch. R is notoriously unenthusiastic (I think he calls it even-keeled), so if he mentions more than once that he likes something, he really, really likes it. This is also the first time I've ever been talked into peeling asparagus. So now I can say, after having done it, that it's not worth it. Sorry French people and Proust lovers, it's not. But if you're just sitting around waiting for your delicious, delicious vinaigrette to mellow at room temperature, and your hands start itching, I mean, go ahead and do it. But you don't need to make it a priority. 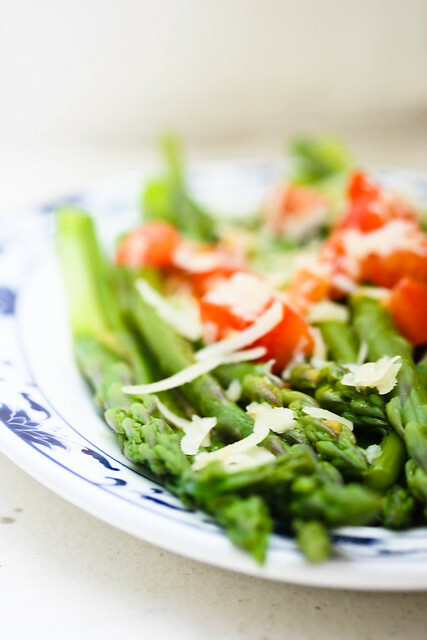 Although the recipe comes from a book called Cold-Weather Cooking (a book which, by the way, has never let me down), it's decidedly of this early-summer moment when asparagus is in season and if you're lucky you can even get some good tomatoes. It's like the reward for months of root vegetables and stews. For the vinaigrette, whisk together the first 4 ingredients in a small bowl. Whisk in the olive oil in a slow stream until combined, then stir in the tomato. Season to taste with salt and pepper and let mellow at room temperature for at least 30 minutes before adding to the asparagus. 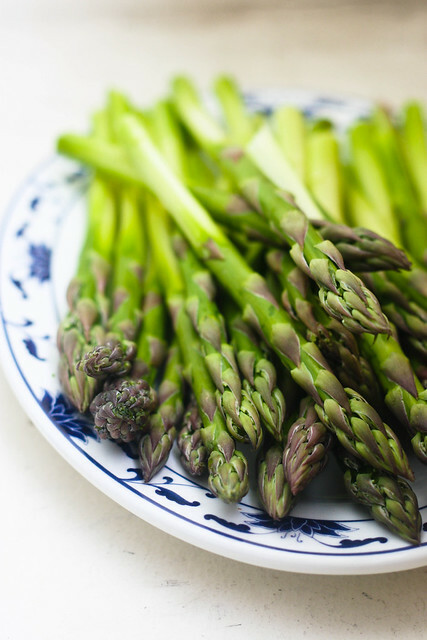 In the meantime, cook the asparagus using your preferred method: steaming or boiling. I boiled mine for about 3 minutes. Be careful not to overcook. Drain the asparagus, but don't shock it in cold water, because you want to dress it while it's still warm. Fan the asparagus out on a large, shallow serving dish. Pour the vinaigrette over the top and sprinkle with the Parmesan cheese. Allow the dish to sit for another 30 minutes so the asparagus can absorb the vinaigrette. Serve. I have never been convinced about peeling asparagus, so I'm glad you concur. In fact, I don't want to lose any tiny little bite of asparagus goodness. Beautiful photos.